There isn't a motorway between Liverpool and Preston. OK, you're right, there isn't. But there was supposed to be. Oh, you're off again, aren't you. This is meant to be vaguely serious! The M59 would have run from the missing junction 2 on the M58, by-passing Ormskirk to the east, and then roughly following the A59 to a junction south-west of Preston. Here it would join the Preston Southern and Western By-passes. The western by-pass (which would probably have been numbered M59) went northwards to join the M55 at the missing junction 2. The southern by-pass (probably M65) went eastwards to join what is now the M65 at Bamber Bridge. The by-passes were abandoned when the M6 was widened to four lanes. Partially due to this, the M59 was gradually trimmed in scale until it disappeared altogether. Can I have a look at a map? I did not know this route had ever had the possible designation of "M59". By the late '70's/early '80's I think it had already been downgraded to a re-alignment of the A59, avoiding the towns and villages along the way. I believe most of the junctions would have been at-grade rather than grade separated like a motorways. During my time at the North Western Road Construction Unit headquarters (1970 to 1974), I was responsible for the M58 and M59. As you rightly say,the M59 gradually diminished in size until it finally disappeared altogether. However, I can tell you that your suggestion that the extension of the Penwortham By-pass was related to this scheme is incorrect. The Penwortham By-pass was a different scheme, and the sharp bend that you show was where one of the Central Lancashire New Town Roads took off from it. The by-pass would then have continued and rejoined the A59 near to the Hutton roundabout. 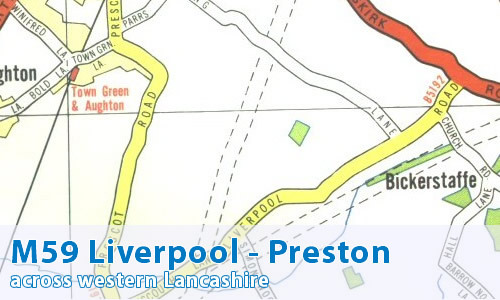 The Preston Southern By pass was further south than this, and joined the M59 and Preston Western By-pass (terminating at junction 2 on M55) very close to the Hutton Police headquarters. No part of any of these roads, other than the piece from the M6 westwards (now numbered M65), has been constructed. Your line at the Ormskirk end is also not very accurate, but this is nitpicking. To be honest, when travelling along the A59, Burscough is the only true bottleneck (well on Monday 17th April 2006 it was!) so building a motorway from Liverpool (well Bickerstaffe) to Preston isn't viable if your only trying to avoid Burscough's traffic problems! Anyway, if you want to successfuly get from the south of Preston to the North of Preston, use the B6241! It goes from the old Docks right up to the M55! Simple! Got through Preston in 15 mins! No need for the M59! I live in Burscough, a by pass would make it a lot easier to turn right onto the a59 from my road during rush hour in the morning! Burscough gets a lot of traffic much of which is commercial, for a small villiage with many schools it is quite unsuited for such vehicles. Any form of bypass would be brilliant. I'm not liking the look of this one. That little blob of green to the east of Ormskirk - yes, that one the motorway would have passed straight through - is Ruff Woods, known for its red squirrel population. Good thing for them it was never built!